One of the major symptoms of menopause, irregular periods are a normal occurrence when a woman reaches a certain stage of life. However, they are also a symptom of a variety of other things, some less benign. If your wife is experiencing irregular periods, and you are worried because she is disinterested in seeing a medical professional, here's some things you should know. What Are Regular and Irregular Periods? Most women get their period between every 25 to 35 days. If they consistently occur within the same monthly cycle and last from between 3-7 days, they are considered regular. Like many other menopause symptoms, irregular periods are caused by hormonal imbalance. During menopause, estrogen and progesterone levels begin to decline, which can lead to irregular periods. However, there are a variety of other causes of irregular periods. If you think that any of these may be the cause of your wife's irregular periods, you may want to suggest that she see a doctor. Unless you are a trained physician, there is nothing medically that you can do. However, depending on the cause of irregular periods, there are other things that you can help with. 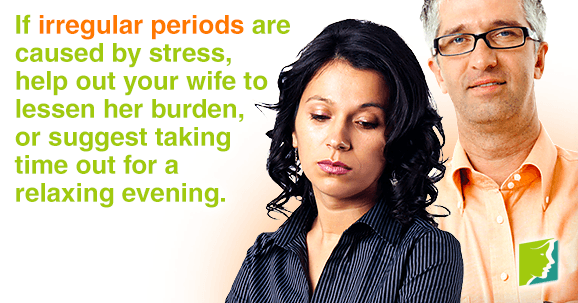 If irregular periods are caused by stress, then helping your wife out whenever possible to lessen her burden, or suggesting the two of you take time for a relaxing evening can help. If the cause is dietary in nature, then you can change diets with her to support her. For example, if the cause is caffeine and she needs to stop drinking coffee, maybe remove the coffee maker from your home and only drink coffee at work, where she can't see or smell it. A big question that many couples ask during irregular periods is whether pregnancy is still possible. During perimenopause, women can still get pregnant even if they have irregular periods. However, after menopause this is not possible. This means it's important to use protection until well after menopause to avoid unplanned pregnancies. If you wish to get pregnant, consulting a fertility clinic may be advisable, as some women with irregular periods may have a little more difficulty conceiving. Irregular periods are common in menopausal women, so it's unlikely that irregular periods are a result of anything serious. However, if either of you is worried, talk to your doctor. Click on the following link to learn more about how to manage irregular periods effectively.